Location: Rosny-sur-Seine, in the Yvelines departement of France (Ile-de-France Region). Notes: Château de Rosny-sur-Seine is a French château of Louis XIII style located in the municipality of Rosny-sur-Seine in the Yvelines department in the Île-de-France, on the left bank of the Seine downstream of Mantes-la-Jolie. 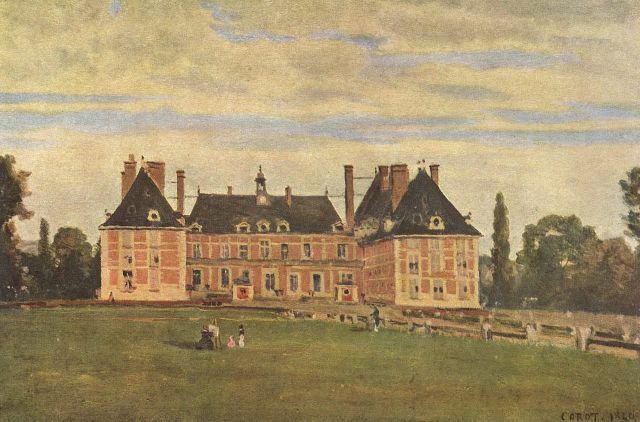 Built at the far end of the sixteenth century to Maximilien de Bethune, duc de Sully, superintendent of finances of Henri IV, perhaps by Jacques II Androuet Hoop, it was redesigned by architect Joseph-Antoine Froelicher for the Duchesse de Berry, owner of 1818-1830. Saved from destruction in 1840 by Count Le Marois, it is carefully restored by the family that owns the Lebaudy until 1955. Became in 1984, along with nine other areas owned by the Japanese company Nippon Sangyoo Kabushiki Kaisha, furniture is sold, abandoned and severely damaged by fire after which the state decides to commit to officio rescue work. It is sold in 1998 to Mr. Bernard Anthonioz who plans to turn it into Relais-Château. It undertakes major maintenance and restoration equity without subsidy (€ 7 million) and then decides to sell it in February 2016. The castle, including the grounds and outbuildings of the subject a classification as historical monuments since July 11, 1941.